Tesla's Lair: A 1920's themed night of Electro Swing and Jazzy House. A night of electroswing and jazzy house held in the Gallery of the old Los Angeles Stock Exchange building. Say you are on the "Ninja Skillz List" at the door for FREE entrance before 10:30pm or $15 before midnight. 1920's attire requested to make time travelers feel at home. No shorts please. ░ ▒ ▓ █ Enter our alternate history. In May of 1929, construction of the Los Angeles Stock Exchange building was nearing completion. Its designers and architects knew that once doors opened for trading, they might not be able to enjoy the building recreationally. Plans were made. A solar eclipse was occurring elsewhere in the world and it seemed like as good reason as any to celebrate. Although Prohibition was in full effect, the Gallery of the building was set to be transformed into a speakeasy. One of the invited guests was a mischievous filmmaker named Nathaniel Hornblower who was also a heavy investor in Nikola Tesla. He had accumulated some early versions of Tesla's inventions for use as special effects in his movies, and he had the unfortunate habit of using them recklessly for his own personal entertainment. He urged those running the speakeasy to name it "Tesla's Lair" for the night, and he was determined to demonstrate Tesla's machines at the exact moment the solar eclipse was happening elsewhere in the world. They agreed. The devices he was most excited about were the Dimensional Screen and a gravity manipulation device. Hornblower failed to realize that using the gravity device when the Earth, Moon and Sun were in perfect alignment would have unintended consequences. He powered up the machine and everyone in that room seemed to vanish into the aether. Upon hearing of the disappearance of the crowd and some of his machines, Tesla postulated that they would reappear three days before the annular solar eclipse in 2012 in another dimension. We are in that other dimension. 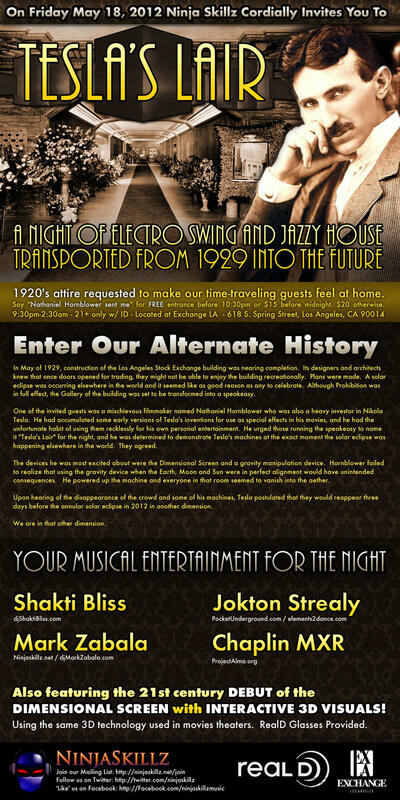 On May 18th, 2012, join us for a night of electroswing and jazzy house in Tesla's Lair as we welcome those who have been transported from 1920s. Also featuring the 21st century DEBUT of the DIMENSIONAL SCREEN with INTERACTIVE 3D VISUALS! It is the firm commitment of Ninja Skillz Music to bring together all manner of art, media, and culture to create multi-sensory, transcendent experiences. By combining diverse dancers, visual artists, circus performers, fire dancers, gods, goddesses, muses, and madmen, Ninja Skillz will continue to be a weapon against the mundane.